The mobile app works like a digital business card, and is a very easy way to for you to pass on my information to your prospects and clients. The best part is, I am notified immediately whenever you refer me by using my mobile app. This way I can quickly reach out to your referrals to introduce myself and my services. 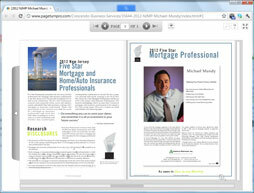 Consistently ranked as one of the mortgage industry’s top producers, Michael Mundy has been taking care of his customers’ needs for a decade and a half. Starting out in the “back office,” Mike initially learned the ropes while working at New Jersey Mortgage & Investment Corporation. By February 2001, he had joined the Pinnacle Mortgage family and began establishing a loyal client base and successful business that has grown exponentially ever since. Having helped thousands of clients achieve their goals and dreams of home ownership, Mike says the most rewarding aspect of his work is educating people on how to make various lending options work to their advantage. He truly enjoys sitting down with people from all walks of life - from the recent college graduate to the seasoned power broker - and walking them through the mortgage process. Figuring out what will make his clients feel the most comfortable, and yet give them the most leverage when financing a new home or real estate investment is another aspect of the business that fuels Mike’s passion as a mortgage banker. Mike resides in Morris County, NJ with his wife Jennifer, and two daughters Samantha and Brooke.